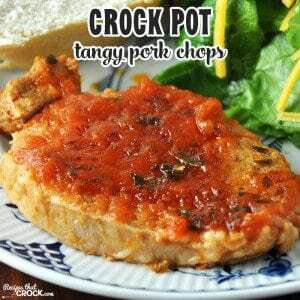 Tangy Crock Pot Pork Chops - Recipes That Crock! Do you love a good tangy recipe? If so, you don’t want to miss these Tangy Crock Pot Pork Chops I adapted from a recipe in Gooseberry Patch’s 101 Homestyle Favorites! I was invited to be a part of a $50 Challenge. What’s a $50 Challenge you ask? I was challenged to see how many recipes I could make for 50 bucks. Well, you know that this frugalista wasn’t going to pass that up! I thought I would buy a big ol’ pork loin and divide it up to get the most bang for my buck. When I saw this recipe, I knew I wanted to use part of my pork loin for these and make them in my crock pot! Never used a pork loin for chops? Don’t worry, Mikey can show you how! Michael absolutely loved this recipe (as did Iyla and Ryder). I liked this recipe, but it was a bit too tangy for my taste UNTIL Michael suggested I try a bit of ranch to help cut the tanginess. That is when I absolutely loved this recipe too. So, if it is a bit on the tangy side for your taste, try it with a bit of ranch, and I am guessing you will be just as happy as I was! 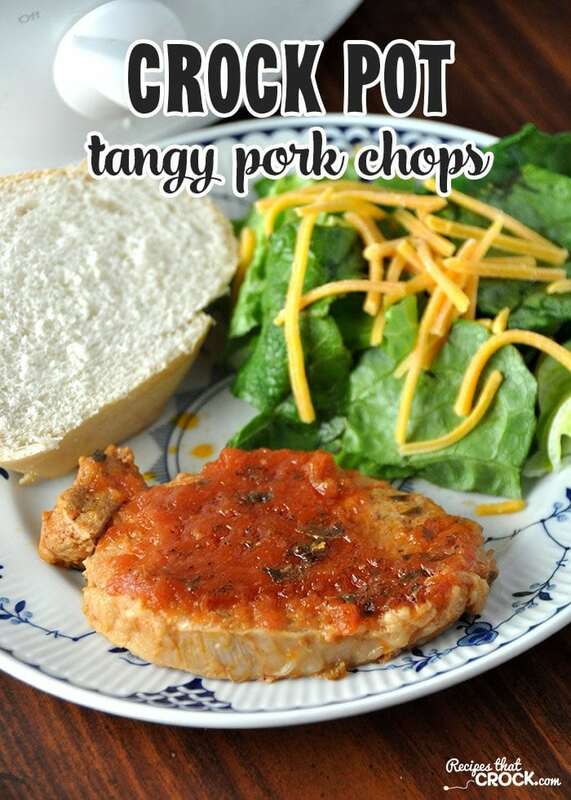 These Tangy Crock Pot Pork Chops are a cinch to make! For these Tangy Crock Pot Pork Chops, I used my 3 qt crock pot. There is a lot of “juice” for these chops to cook in, so if your family needs more than 4 servings, you can definitely add more chops, just use a bigger crock pot!